I’m turning 32 years old this year. I have everything I could ever possibly need. Many people don’t. This year, I want to use my birthday to provide clean water for at least 32 people and I’m going to need your help. 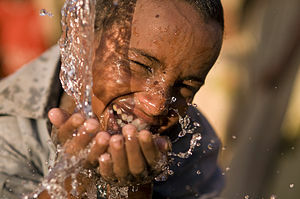 I’m asking for donations small and large toward an initial goal of $649 to provide clean water to 32 people through charity: water.This money will go to build freshwater projects for people in developing countries. Will you help me raise these funds? Almost a billion people in the world are living without clean water — but how much are they really living? Millions contract deadly diseases from contaminated water. 30,000 people will die this week alone. The lucky ones won’t, but still have to walk hours each day to get dirty water for their families. My birthday wish this year is for all of us to give whatever we can — a king’s ransom or a widow’s mite — for clean and safe drinking water to some of the billion people living without it. The best part: 100% of all donations go directly toward water projects. And about 18 months after this campaign ends, charity: water will show us where and how every dollar we raised ended up helping in the field. We’ll see GPS coordinates, photos and more details about the communities we’ve impacted.